Or, if the priest did not spell it correctly, it could be Księdzularz. If you Google Księdzularz you will find people with that surname. Couldn't find a baptism for Andrew so you're probably right that he was born in Poland – if that's the case they were busy going back and forth with young children in tow. Found Anna's baptism: Anna born Dec. 5, 1912, baptized Dec. 22, 1912, parents Antoni Dzielski and Anna Księdrularz (quite clearly spelled this way), godparents Franciszek Bobak and Julia Mrówca, Thomas J. Bobak, pastor. I'm back. Had to wait around for a repairman to show up. Found Aniela (Angela) Raphaela born Oct. 22, 1909, baptized Oct. 24, 1909, daughter of Antoni Dzielski and Anna Księzularz, godparents Joseph Bulleda (??) and Ludvina Breja, Thomas Bobak, pastor. She would have been 6 months old in April 1910 when the census was taken. Thank you very much. Look for Andrew's birth in Poland. Is Anthony who sailed in 1939, was traveling with his wife. Where is his wife , he lived with his daughter and died in 1944 . Could she be in Poland? Antonina~ Good questions. I just thought I'd check the church records for Andrew, in case the Poland birth info was not correct. As for Andrew's birth/baptism record in Poland, as you can see if you read the first postings on this thread, the church records are not easily found for the Dzial area. The records from this area have not been microfilmed by the LDS Church and very few records from this area of Poland have been indexed on the Polish genealogy related sites. Finding the record at this point would require a trip to the church in Poland or hiring a researcher in Poland to find the paper record. My grandparents both came from towns within 20 mi. of Dzial and I was able to see their records at the churches when I visited in 2009. My friend with the Polish call to the Registry Office . In Poland, the birthplace of Andrew and Joanna . Andrew was born 1910 in Dział, Joanna was born 1914 in Dział. Maybe Anna was in Poland with her daughters Angela and Joanna. The reason the marriage was not indexed on the PGSA site is because Cyril & Methodius parish was founded in 1891 as a Bohemian ethnic parish but later a lot of Poles were members of the parish. I went to high school with quite a few Poles who were from that parish. The notation PL mentioned in the church marriage register reads: "Matrimonium 30 Decembris 1907 coram judice conjugaverunt." and is translated as "They were joined in marriage before a judge on December 30, 1907." It doesn't tell you anything you don't know from the civil license and certificate. However, according to Catholic Church law the marriage before the judge was invalid due to lack of canonical form. (Marriage between to Catholics had to take place in the presence of a priest and two witnesses to be recognized as valid.) As far as the Catholic Church was concerned the date they were validly married was the date of the church wedding. Technically, the church wedding was referred to as a validation of a civil marriage. Catholic marriages did not take place during the two penitential seasons, Lent and Advent, because the festivities of a wedding were not in keeping with the somber character of those seasons. Weddings also did not take place during the octaves of the feasts of Easter and Christmas so basically there were no weddings during parts of the months of February and April and not at all during the month of March---the exact "weddingless" dates depended on the variable dates of Ash Wednesday and Easter. It is also safe to assume that no weddings took place during the month of December. Wedding friendly time began after January 6 and ran until Ash Wednesday and then began again after the first Sunday after Easter and ran until the first Sunday of Advent. However, in rural Poland, although Church law permitted weddings for much of the year, the actual times when most weddings took place was dictated by the busy seasons on the farm. People generally married during the"down times" of farm life---January until the beginning of Lent (before spring planting started) and the months of October and November (after the autumn harvest was over). Weddings did take place in late spring and during the summer as well as in early autumn, but the vast majority of couples didn't want to marry during the times when their friends and relatives were too busy with farm work to give the wedding celebration their full attention. Thank you for your response . Dzielska Anna was born in Zakopane . Her parents were Jacob Bachleda Księdzularz and Teresa Gąsienica. She came to the USA in 1905 . Maybe someone found her passenger lists . Is there somewhere in her date of birth ? In 1910 he was 27 years old . I have looked a little for Anna's passenger list, but I haven't found it yet. I haven't seen anything that has had her birth date on it. Anna's father had two surnames? I have seen that surname combination online. I think there is at least one person in Zakopane with the Bachleda Księdzularz name. I think they must be a relative of yours because it is a rare name. Yes Anna name Bachleda Księdzularz. Friend in Poland called to the parish may know something. Thank you all for your help. Unfortunately, in Poland there is of her death . And do you know when Andrew Dzielski came to the US. Maybe his mother came with him. So far I've found a branch of my family tracing back to Dzial. Their father was Wincenty Myrda and mother was Anna Bachleda. The children were Jan (1884), Jakub (1888), Piotr (1889), Antonina (1891) and Aniela(1897). There's also another brother that I found in a passenger list as Jan Myrda traveling to his brother Jan Myrda. I don't know if that's a transcription error or if there were two brothers named John. My grandmother had talked to her father-in-law, John Myrda, about his family and wrote down years later that the siblings were John, Jacob, Peter, Stanley, Andrew, Antoinette and Angeline. Unfortunately I was called by my uncle's names and father's name a lot when I was a kid so I don't know if those are right or wrong. Most of them match up. I found most of the family traveling to the US. Peter and Jacob travel to Chicago, IL. John, Antonina and Aniela travel to Gallitzin, PA. Eventually they also go to Chicago, IL. I don't find the second John anywhere. I'm not sure if he died or if there was a transcription error and he's really Stanley or Andrew. 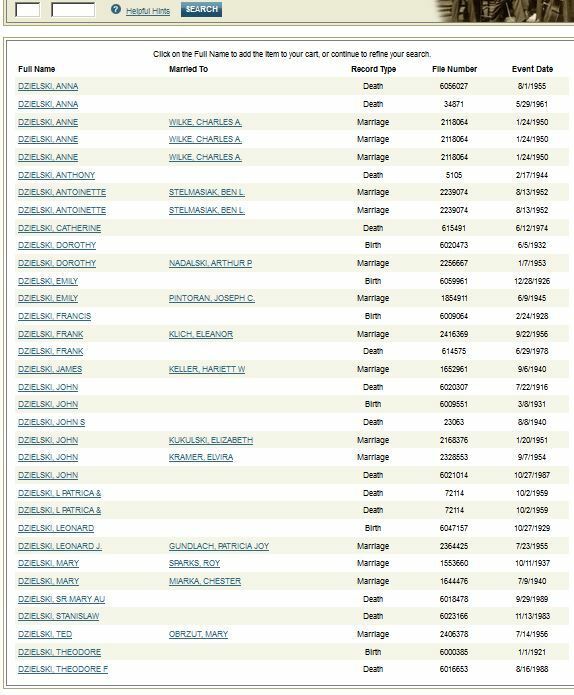 Some of the siblings I found in the Dziennik Chicagoski death notice and I'm waiting for that those to see what names are listed. I also found a brother of Vincent and his family from Dzial. Their father was Stanley Myrda and mother was Magdelena. The children which came to the US, as far as I've found, were Justina (1877), Jakub (1881), Agata (1885), Jan (1887) and Aniela (1898). It appears they traveled to Chicago, IL, Gallitzin, PA, Welland, Ont and New York. I haven't located the name of Vincent and Stanley's father and mother yet. I think there was also another brother but he might have lived in Morawczyna. I found one person coming from there and listing a Jacob as a cousin and a mother who wasn't Magdelena or Anna. They could have been half siblings of one of these families but I haven't worked any of that out yet. I'll edit this if I can when I get more information. I've been researching my family history and have just started really digging into my mom's side of the family. My great grandfather was Vincent Dzielski - born abt 1879 in Galicia, died in 1911 in Chicago, IL. (I have seen plenty of info on the Vincent mentioned in this thread who died in 1959 but not for my great grandfather) Vincent was married to Mary, who was born abt 1885 in Poland and died in Ohio in 1963. Vincent and Mary had three children while still in Poland. Stanley, born 1906, Henrietta, born 1908, and my grandfather John born May 10, 1909 in Dzial. They came to the US shortly after - I think Vincent came to the US in 1909 and the rest of the family in 1910. They had a brief stint in Chicago before moving to Ohio. I'd be so thankful for some help.